This deliciously rich and creamy rice pudding is made with coconut milk rather than dairy. Pineapple chunks add wonderful contrast. Split the cardamom pods and remove the seeds. Discard the pods. Using a mortar and pestle or the end of a rolling pin, crush the seeds to form a coarse powder. Place the coconut milk with 400ml cold water in a pan, then stir in the cardamom powder and caster sugar. Heat gently until the sugar dissolves, then bring to the boil. Reduce the heat to a gentle simmer. Place the rice in another pan, then stir in a third of the warm coconut milk. Bring to a simmer, stirring constantly until nearly all the milk has been absorbed. Gradually ladle in the rest of the milk, again stirring continually and ensuring each addition has been fully absorbed. Continue until the rice is tender (about 20 minutes). Toss the pineapple chunks with the brown sugar to evenly coat, then tip into a small, hot, frying pan for 2-3 minutes, turning so that the sugar begins to caramelise. Spoon the rice pudding into shallow bowls, then top with the caramelised pineapple and chopped pistachios. 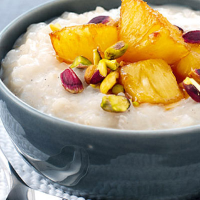 Vary the flavour of the rice pudding by replacing the cardamom with a few drops of rosewater. If time is short, omit the pineapple topping.